I'd like to introduce everyone to a manga series called Sukeban Deka, for reasons that should soon be apparent. It ran from 1977 to 1982. Sukeban Deka means "Bad Girl Cop," a reference to the main character. Meet Asamiya Saki. Our pink-haired heroine starts the story as an inmate in a youth reformatory before she is recruited to become an undercover "student detective" at a high school. Because she's a teenager, she can infiltrate schools and solve crimes committed by students much better than regular detectives could. The police threaten to have her mother, a death row inmate, executed if she doesn't comply. In time, however, she finds her own reasons for fighting crime - despite being a criminal and an outcast, she has a strong sense of justice and other students look up to her. Her favored weapon is a bulletproof yo-yo. Sukeban Deka is an action epic with a massive plot spanning 12 volumes, but the part that's most interesting for our purposes is a pair of chapters titled "The Witch Hunter" and "Cinderella's Other Face." During this part of the story, Saki transfers to an super-exclusive private school called Shirayuri (White Lily) Academy, where she's to solve a murder. A girl named Etsuko (lower right) died after falling off a balcony during a school play. Did she fall or was she pushed? Most people suspect the latter. Etsuko was one of three girls competing to win a guy named Minowa Mitsuhiro's (upper left) hand in marriage. He's the super-rich heir to a jewelry company. 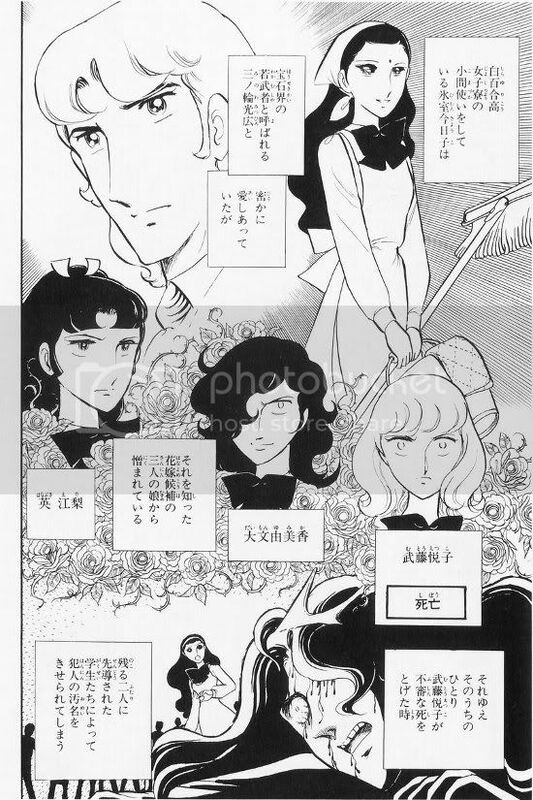 The two other suitors, Eri (center left) and Yumika (center), are sociopathic Nanami clones on steroids. The blame for the murder is placed on Kyoko, the girl at the upper right. Despite attending this ultra-snooty school, Kyoko has a more proletarian aspect than the other girls, often seen wearing a scarf on her head and mopping the floor. She also has a bindi on her forehead for some reason and other students call her 'witch' after she's accused of the murder. A social outcast, she is forced to do the bulk of the school cleaning chores by her peers. She was near the stage area when Etsuko fell during the play, so everyone thinks she's responsible for the murder, but Saki has her doubts. After Saki defends her from a group of accusers, she says "Thanks for the other day! You were so cool... like a prince!" Saki and Kyoko become fast friends and Saki works to prove her innocence. Eri and Yumika try to trip her up, but their high-society bitchiness is no match for a girl who grew up brawling every day. Saki hatches a complicated plan to clear Kyoko's name. She reveals that Etsuko died because she put cyanide into her facial cream. She was trying to poison Yumika and Eri, but she made a mistake and basically ended up killing herself by accident. Kyoko tearfully admits that Etsuko tricked her into helping with her murder plan, and she didn't want to speak up because no one would believe her. 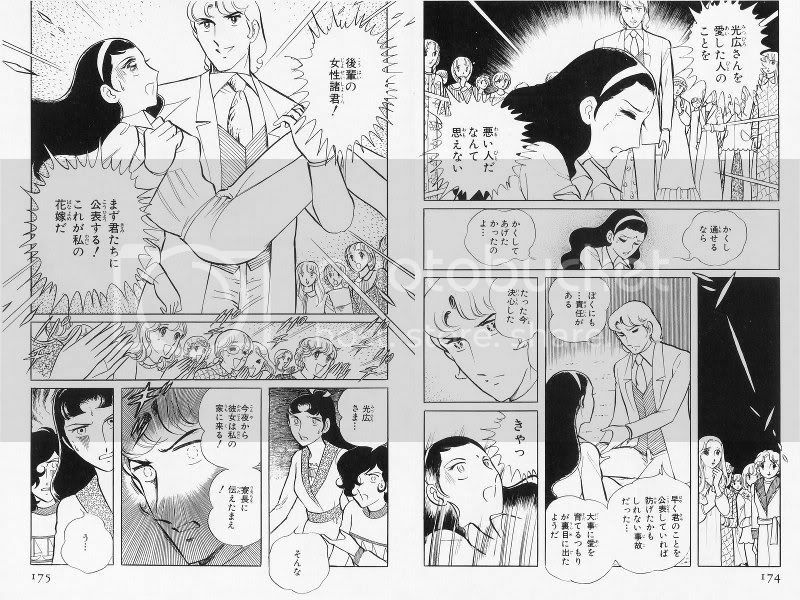 Then, in a sudden twist, Mitsuhiro shows up, sweeps Kyoko off her feet and declares that he's going to marry her. Apparently he'd always loved her from afar. A happy ending, right? Not quite. This is the beginning of the second chapter, called "Cinderella's Other Face." Kyoko wastes no time informing the reader that she actually masterminded Etsuko's death. In the meantime, Eri and Yumika are none too pleased about Kyoko's engagement to Mitsuhiro and decide they'll resort to murder to rectify the situation. Their plans end up failing... gruesomely. Yumika hires an Evil Black Man(tm) to mangle Kyoko's face by punching her with spiked knuckles. Kyoko manipulates the situation so that Eri is in the place where she was expected to be and Eri ends up getting her face turned to hamburger instead. Yumika is pissed about this and Kyoko comes to visit her. Yumika attacks Kyoko, but this was all part of an elaborate plan by Kyoko to unleash a rabid dog on Yumika. Yumika gets bitten and breaks the dog's neck (! ), but despite receiving immediate medical attention, she ends up dying of the rabies infection. Saki, in the meantime, does some detective work and uncovers more and more proof that Kyoko isn't what she seems. Finally, she goes to Mitsuhiro's mansion to confront Kyoko. 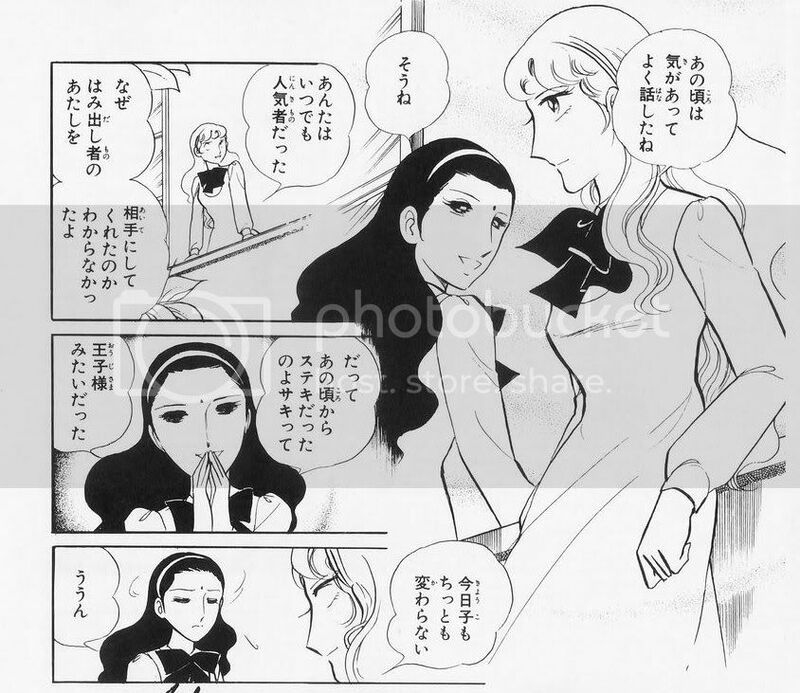 Kyoko tells Saki that she is dying of cancer and wanted to have a taste of wealth and glamor before she died, hence her seduction of Mitsuhiro and the elaborate multiple murder plot. She attacks Saki, but Saki defeats her and corners her. "Why should I feel a thing for what happened to those three? They hurt so many people... stepped on so many people. They just got what they deserved." "I loved Mitsuhiro, but there's someone else I love more." "Didn't I tell you? You're so cool... like a prince." "It's like the doctors told me, the medicine isn't working anymore and I'm getting weaker and weaker. I surrender. Tell Mitsuhiro I said goodbye." Saki runs, promising to get help for Kyoko, but Kyoko takes out a Box With a Button(tm), presses it and blows herself up. Saki displays a bit more than the usual level of sorrow over a dying villian, wishing Kyoko hadn't taken the path she did. The other guy here is Jin Kyoichirou, a suave detective she's often teamed up with while fighting crooks. So let's summarize... at an exclusive private school, a pink-haired "prince" meets an outcast "witch" with a bindi, befriends her and stands up for her. Behind her facade of victimhood, the "witch" is a master manipulator, but this too is a facade hiding her profound inner pain. After much conflict between themselves and with others, the "prince" sees the "witch"'s true self and they make an emotional connection, but they are separated immediately afterward. Thoughts? Sukeban Deka is an awesome manga in general by the way, it has some of the most over-the-top action you've ever seen. It also has graphic violence that would get rejected from a modern shonen series, never mind shoujo. 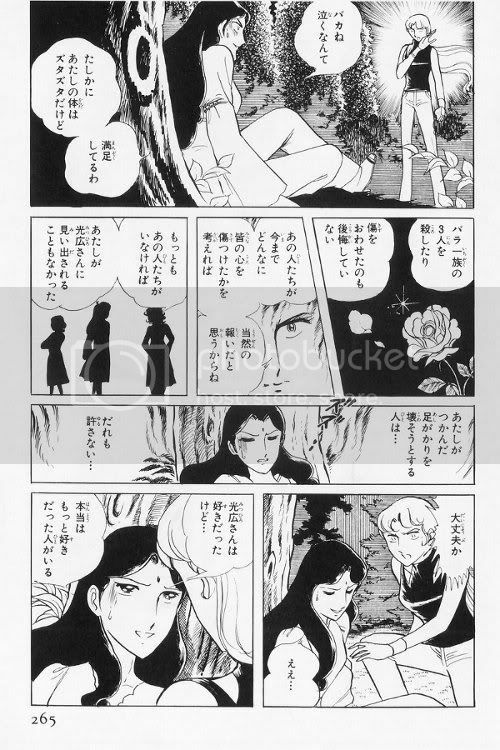 Anyway, just a bit of manga archaeology that may shed some light on SKU's roots. Thanks so much for this! I read the whole detailed post with screenshots, and now I'm interested in reading it. Unfortunately, there don't seem to be any US releases or scanlations : (. In any case, great insight. I liked the use of animals, especially. Haha. That is . . . pretty crazy. Thanks for that, very nice post! Their undersized foreheads keep bothering me though. Some other things to add about the Utena/Anthy parallels. Saki stands out from other students because she's a delinquent who takes down street thugs by the dozen, and she's something of a hero to her peers but she is also isolated because she's so different. Kyoko shares some of her qualities - the isolation, the will to power - but she is conniving and covertly hostile whereas Saki wears her feelings on her sleeve. Just like Utena, Saki likes to give shouted speeches chastising opponents for their evil ways. But Saki's opponents usually meet gruesome deaths instead of just getting a rose knocked off of their chests. While SKU's message can be considered primarily feminist, I think SD's main message is against ageism and the social marginalization of young people. Saki is imprisoned in a series of increasingly freakish and abusive youth reformatories where inmates are used as slave labor and occasional snuff film fodder by perverted wardens. Most of SD's story is about a big overarching criminal conspiracy that wants to launch a new fascist movement and take over Japan, and one of its major tools is a right-wing student movement. The "final boss" villain is basically an avatar of militant Japanese conservatism who wants to turn students into footsoldiers for his cause. 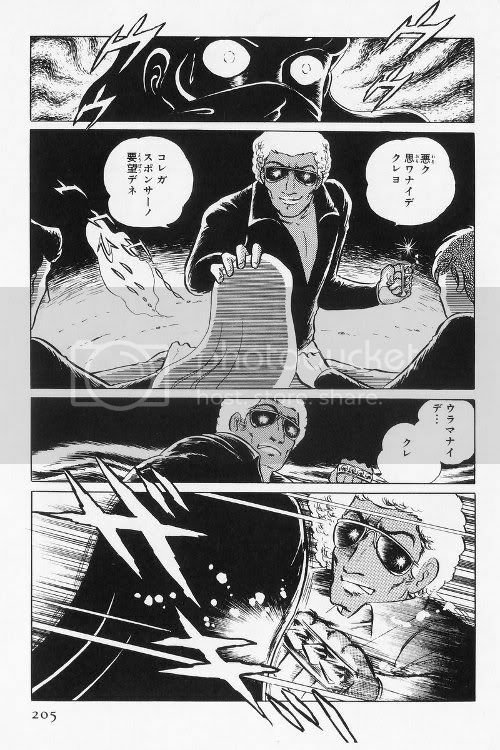 Saki responds to his plan by shouting that "I'm the student detective, and I fight for the students! I'll take down anyone who thinks they can exploit us!" Throughout the series, much is made of Saki being the only person who can fight for the interests of students because adult society disregards their problems. Very much the prototype of a Revolutionary Girl, and in some ways a more subversive one than Utena, since Saki fights against forces and ideas that are more specific to contemporary Japan than the more universal sexist ideas that SKU attacks. It's interesting to note that Sukeban Deka was one of the most popular series in the history of Hana To Yume, the manga magazine that it ran in, despite being one of the most violent girls' comics of all time. There are graphic depictions of people getting dissolved in acid and a particularly nasty scene where a girl's eyes are put out with hot pokers, but the series's schoolgirl audience ate it up and it was obvious by the end of the series that Wada Shinji, the author, was compelled to continue it for a lot longer than he planned to. Yep, that was the Sukeban Deka OAV, the only piece of Sukeban Deka media that was ever officially translated to English. It covers the best-known part of the manga where Saki fights a crime family of three sisters. I first got into the series by watching it, and if you want to see it and you know Spanish there's a Spanish version of it on YouTube. Sukeban Deka was also adapted as a live-action TV series that really sucked IMO, and there was also a movie that came out in 2006 and revived some interest in the franchise. 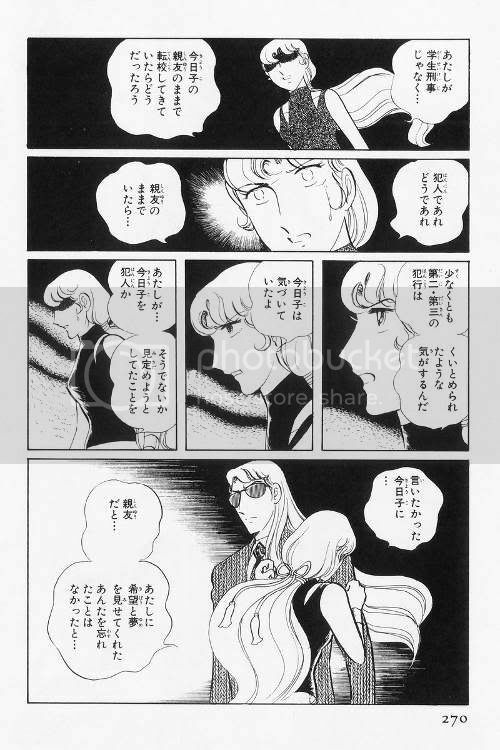 I think you got it right: The relationship betwen Saki and Kyoko is a great parallel to the relationship between Utena and Anthy, but I think this is even more obvious in the relationship Saky / Remi Mizuchi or Saky / Naru: The hero against the cruel manipulator. The really sad part is that doesn’t matter how cruel, manipulative and even victorious the villain is, she never could break the hero, just because the hero chose not to give up to despair a long time ago. 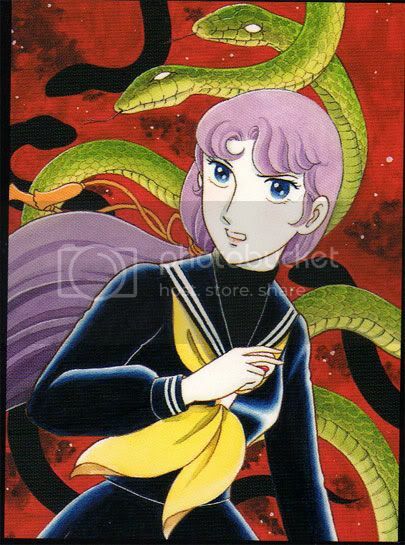 I believe than in Sukeban Deka, Remi dies trying to save Saki (and so does Naru, Saki’s mother). In Utena, the final show us that Anthy knows that Utena is in some place that she can go, and goes searching for her. Utena doesn’t exists anymore, but even then she is not defeated. Like the poignant end of the manga Sukeban Deka show us that Saki, like Utena, is not going to let something like death itself stop her. I have nothing to add, save that even though I tend not to like manga from this period Sukeban Deka looks awesome, and that this is a fantastic piece of detective work. Many thanks!